KLM Royal Dutch Airlines is one of Europe’s best-known airlines, a forward-thinking company, and a leader in commercial aviation with a long-standing history of innovation. With the introduction of their flight routes to China, KLM wanted to establish more authentic relationships with a Chinese customer base in the UK. Enter multicultural digital marketing agency, Sheng Li Digital. With our expertise in reaching Asian audiences, Sheng Li helped launch campaigns with KLM to advertise flight routes from the UK to China. Knowing that Chinese speakers are the world’s most active social media users, KLM knew they needed to speak fluently to this audience to boost online buzz. 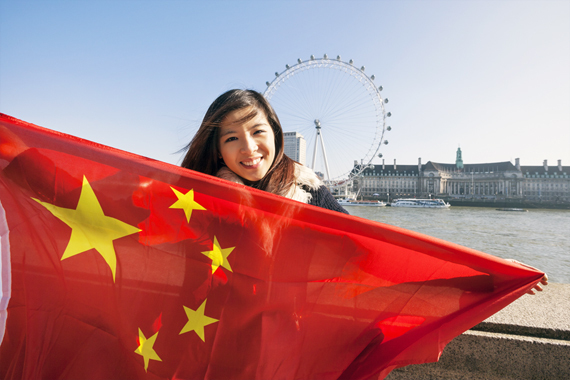 For the first time ever, KLM UK was able to reach a previously untapped Chinese-speaking audience. To help KLM reach this undiscovered demographic, Sheng Li formulated and implemented creative advertising campaigns, social media contesting, and performed influencer outreach. The campaigns centered around sharing great, on-brand content that helped KLM remain competitive in a multicultural world. The end result of this collaboration? Increased awareness of and affinity to the brand, strong social media engagement, and increased plane ticket sales. Read on for the full details. The Chinese population in the UK is comprised of over 1.5 million people. Due to the difficulty in obtaining UK citizenship and not feeling fully integrated into British culture, the majority of the Chinese migrant population still hold original passports, and maintain strong ties to family and friends back in China. Additionally, as the number of young adult international students from China continues to rise year after year, travel from the UK to China is of particular relevance for this target demographic. Although Christmas is not widely celebrated among the native Chinese population, the UK holiday season and winter break provides an opportunity for Chinese citizens to return home to visit their loved ones. KLM’s ‘Home for the Holidays’ content was created to resonate these values, highlighting deep emotional ties to China and the comfortable familiarity of reunion over the winter break. Promote awareness and knowledge of KLM’s flight route offerings to the UK-based Chinese-speaking population. 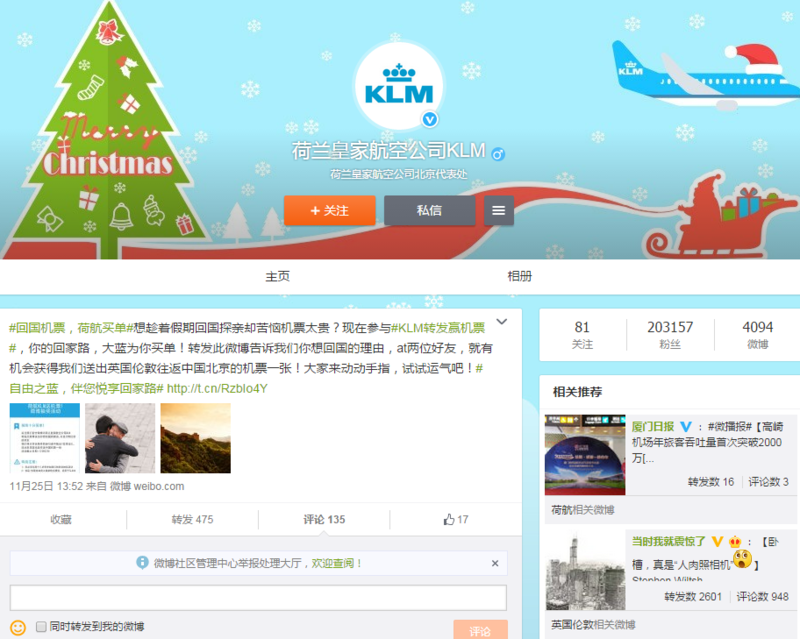 Increase engagement with KLM’s social media content on Weibo and Facebook. Drive traffic to Chinese-translated landing page with specific UK-to-China route information. With these intentions in mind, Sheng Li Digital created uniquely curated content on each of KLM UK’s social channels for fans and influencers. How did KLM reach the world’s most active social media participants? Sheng Li Digital leveraged influencers, as well as paid advertising opportunities on Weibo and Facebook, to increase 1) reach of KLM’s messaging and 2) engagement with target audiences on relevant social media platforms. 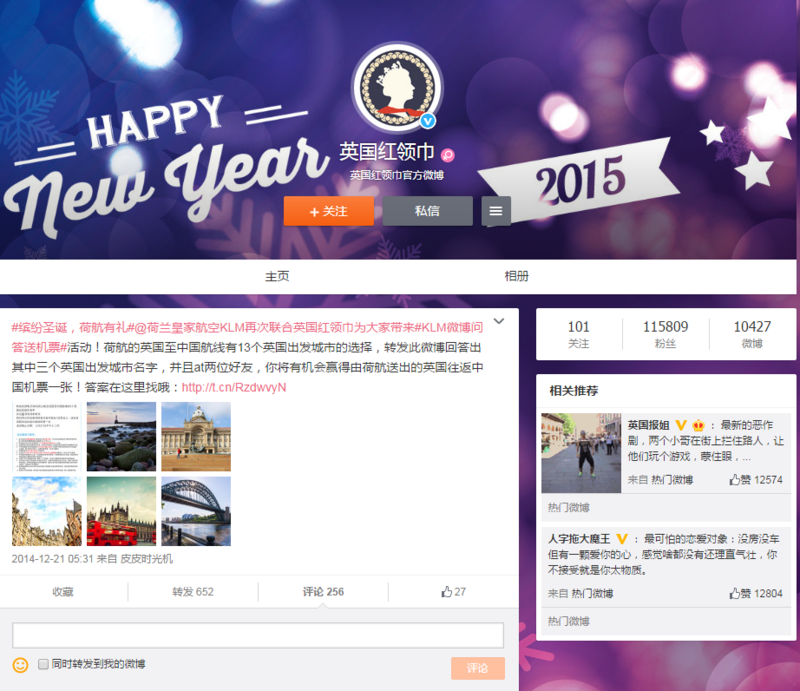 In November and December of 2014, Sheng Li developed promoted posts based on eight distinct creative concepts tying back to the overall campaign theme. The various concepts positioned KLM as a trustworthy and established brand, introduced the flight crew to showcase the brand’s personality, and leveraged promotions for holidays including Christmas, Chinese New Year, and Singles’ Day, China’s anti-Valentine’s Day that has become the world’s biggest eCommerce holiday rivaling American ‘Black Friday’ sales. Each concept was adapted to be successful on both social media platforms. Goodie prize giveaways, influencers, and informational and branded content were integrated into the content mix to ensure strong engagement and relevance among KLM’s follower base. To keep KLM top-of-mind during the holiday planning period, Sheng Li Digital engaged Weibo users with a promoted post question and re-post contest. The contest was further amplified when we engaged with relevant influencers and motivated them to re-post content to their followers. The ‘Winter Break Contest’ resonated strongly with the target audience, resulting in a total of 166 contest related actions and an impressive 475 re-post contest entries. An estimated 6,000+ likes were also achieved. For several years now, I could not go home for Chinese New Year. As a girl staying in the UK alone, I felt very sad for myself and very sorry to not be there for my parents. I miss my hometown so much. I remember when I was young, in winter, when it was snowing, I always went out with my friends; we built snowmen and had snowball fights. I really want to go home this year for Chinese New Year, and to be there with my friends and family. So please wish me good luck! Another dynamic contest that we created as part of the campaign, and performed exceptionally well, was the ‘Departure Cities Contest’. This promotion led to a total of 251 contest-related actions and an incredible 667 re-post contest entries. This is more engagement than any other post from KLM’s Weibo and was particularly remarkable, as this was achieved in a very short time period of merely six days. 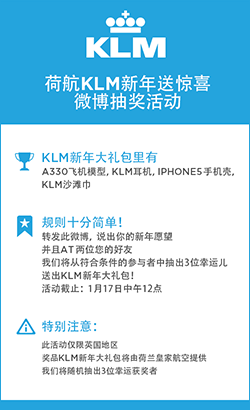 Throughout the campaign, Sheng Li connected KLM Royal Dutch Airlines with influential content creators on Weibo to create compelling and authentic earned media centered around air travel with KLM. These brand advocates are prominent bloggers who are interested in reviewing KLM’s flight routes or collaborating in a creative way. For the ‘Winter Break Contest’, influencer amplification targeted over 162,000 relevant readers with branded content messaging, while also resulting in an additional 51 contest entries through re-posts, and a total of 65 additional engagements. Popular Chinese influencer WeLiveInUK created a series of Weibo posts sharing his flight experience with KLM from the UK to Shanghai. By encouraging his audience to follow his journey, KLM-branded content reached over 68,000 UK-based followers who connect with this passionate Weibo influencer. I want to thank @KLM again for this invitation. It’s really good to be home. My trip home with KLM started from the UK Heathrow airport, I transferred from the friendly Amsterdam Schiphol airport hub and then landed in Beijing. The most impressionable part of this trip for me was the convenience and KLM’s dedicated service. You can read more about my experience with KLM through the below long Weibo. With our help, KLM learned to use social media effectively to support communities of brand advocates. Through these platforms, KLM encouraged and inspired followers to share their own stories. In doing so, they were able to attract happy and loyal customers. Paid advertising was utilized on Facebook and Weibo to further distribute social media content to a broader audience and further the reach of the campaign messaging. In addition to Promoted Posts on Facebook and Fen Si Tong (粉丝通) on Weibo, Sheng Li explored brand new advertising features to reach the Chinese demographic. Weibo’s paid sticky posts were set up and were only visible to KLM’s followers, displayed as the first post in each follower’s news feed interface. These ads strengthened the brand-to-audience relationship—and ensured that KLM’s message was resonating with people who were the most interested in the brand and the campaign content. 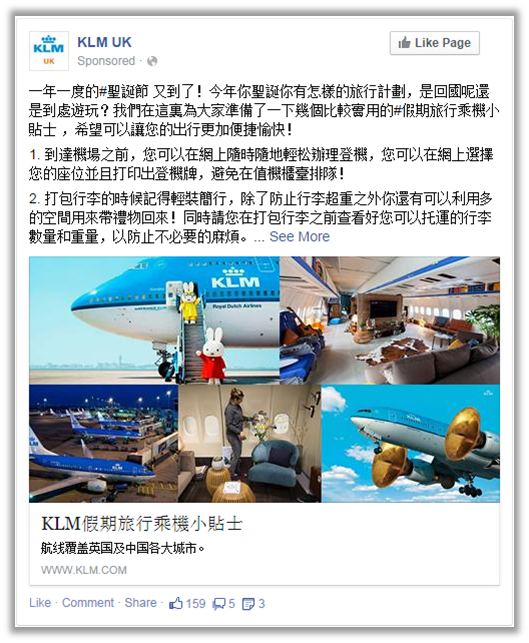 On Facebook, Sheng Li used dark link posts to promote limited-time promotional fares for KLM’s UK to Shanghai route. These unpublished posts did not appear on the brand’s timeline, but were exclusively viewable as an ad unit. This feature presented users with advertisements that were extremely targeted, both geographically and by interest, with relevant content exclusively for them. Combined with Facebook’s Custom Audiences functionality, these high-impact ads were tailored to a very specific target group and directed them to a relevant optimized custom booking page on the KLM website. The familiar winter-break travel opportunity and associated ‘Home for the Holidays’ themed content resonated exceptionally well with users on Weibo and Facebook who were looking to travel home to China over the UK holiday period. These social media amplification techniques allowed KLM to serve their customers on a much more personal level. Sheng Li Digital helped KLM Royal Dutch Airlines promote their holiday flights to China, while successfully gaining stories from the UK’s Chinese demographic that populated their social media presence with authenticity, relating the campaign with an emotional connection and having potential customers think about going ‘home’ to China. 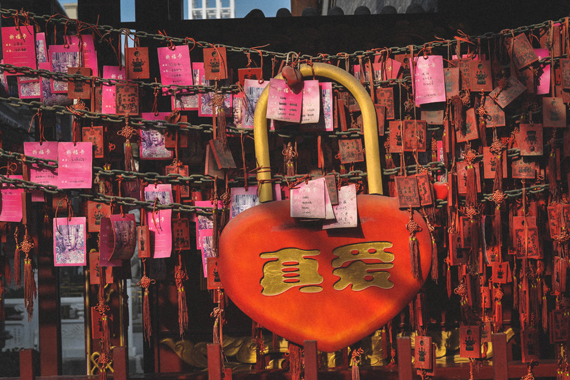 This sense of authenticity was deepened through engaging with prominent Weibo users, whose promotion of KLM messaging resulted in heightened trust and increased reach for the brand. Advanced advertising techniques supported brand awareness with detailed targeting—engagement levels were best-in-class, and the response from Chinese speakers proved that users were eager to join the conversation, keeping KLM top-of-mind when they purchase flights. Through emphasizing KLM’s cultural recognition and ties between the UK and China, we were able to connect with the universal need to go ‘Home for the Holidays,’ and encourage the socially-active Chinese demographic to collaborate with their own stories and engagement—a conversation that took place in the perfectly fluent language of home. Our experience of working with Sheng Li Digital was exceptional. This was the first time that KLM UK had run a social media campaign on Weibo—and we were, of course, cautious at first. After the first few posts, it was clear that we could create exciting engagement towards this extremely targeted audience and we were very happy with the positive sentiment we received. The results clearly spoke for themselves. We commend the Sheng Li team for their flexibility and nimbleness in adapting to last minute campaign changes. We liked the fact that the project managers were always available to answer our questions, even with the difference in time zones. It really helped our campaign to reach out to Sheng Li. Without a doubt, we value their in-depth knowledge when it comes to the Chinese demographic, and feel that we would not have run such an impactful campaign without their expertise.